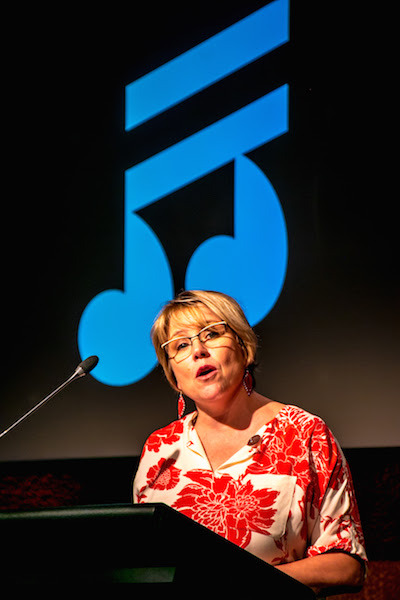 Aucklanders warmly welcomed Music Canada Executive Vice President, Amy Terrill, as the keynote speaker at their recent launch of the Auckland Music Strategy, Te Rautaki Puoro o Tāmaki Makaurau. 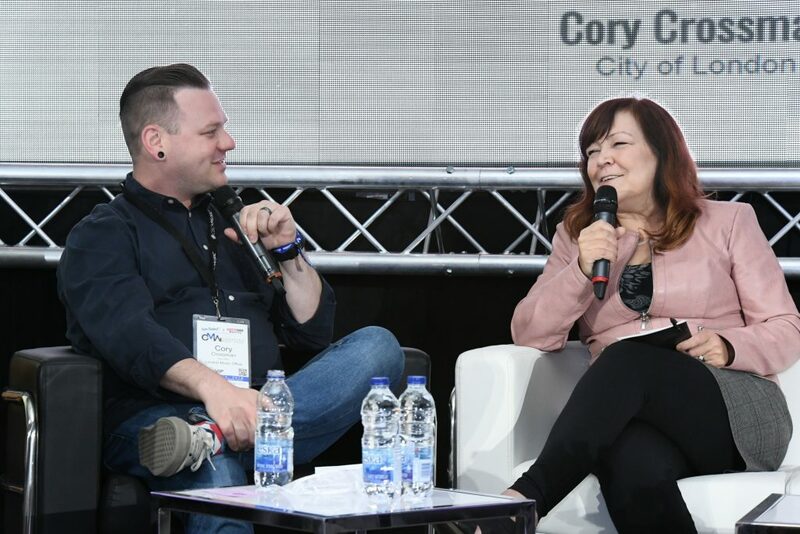 Terrill provided an international perspective to the event, commenting on the growth of the Music Cities movement, Toronto’s experience, and providing some considerations for Auckland as it implements its three year strategy. 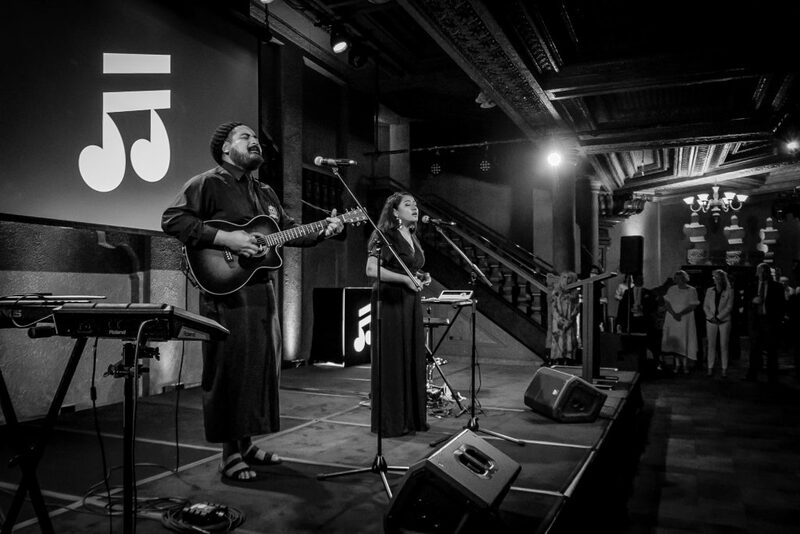 Other performers included Irene and Saia Folau. 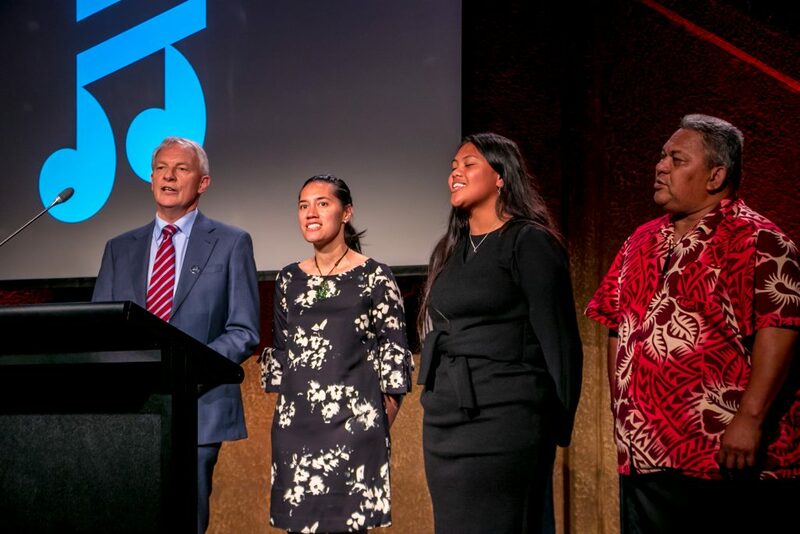 Auckland Council, one of the key partners in the initiative, was well represented with several elected councillors and key staff in the room and remarks by Mayor Phil Goff. Prime Minister Jacinda Ardern, unable to be there in person, expressed her support through a video message. PM Ardern recalled the first time she was “pitched” on the idea of Auckland as a UNESCO City of Music, and congratulated the industry and civic leaders who worked on the effort over the last two years. 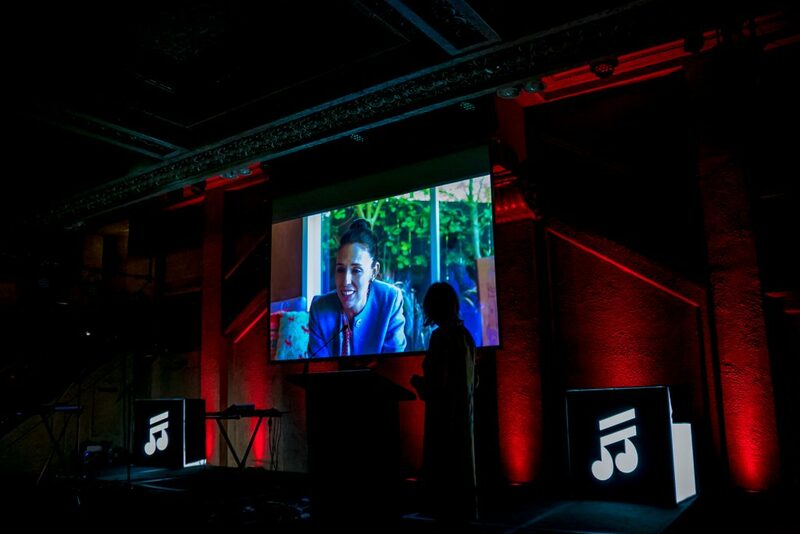 The leading proponents of the initiative, Recorded Music NZ and APRA AMCOS, were represented in remarks by Anthony Healey. 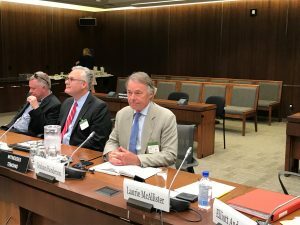 The strategy cites Music Canada’s groundbreaking report, The Mastering of a Music City, and Healey noted the importance of this research in the steering committee’s efforts. Throughout her remarks, Terrill provided concrete examples of strategies and tactics that have been deployed successfully in other parts of the world, some of which might be helpful for Auckland. However, she was careful to point out that there is no “cookie cutter approach” and that the way the Auckland strategy is “rooted in what makes your city unique – the diversity of voices and sounds – your unique cultural identity, heritage and position in Australasia,” is very important. “I see that the City of Auckland values the integration of arts and culture in everyday lives and is working to stimulate the participation of Aucklanders in the arts and employment in the creative sector. I understand you aspire to be a city where “talent wants to live.” The development of this strategy and inclusion in the UNESCO Creative Cities network is a great first step,” Terrill said in closing. “Ngā mihi nui,” meaning I wish you well. 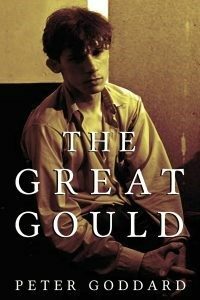 Goddard is an accomplished Canadian music journalist and historian who won the 1973 JUNO Award for Music Journalist of the Year. He has also written books on Ronnie Hawkins, Triumph, David Bowie, and many more musicians, as well as his 1989 book Shakin’ All Over: The Rock ‘n’ Roll Years in Canada. Nicholas Jennings is a renowned music journalist and historian who has written on music for Maclean’s, Billboard, the Toronto Star and the Globe and Mail, among many others. 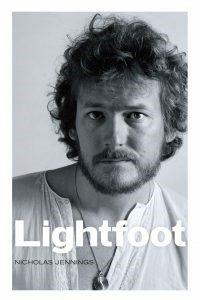 His books on Canadian music include Before the Gold Rush: Flashbacks to the Dawn of the Canadian Sound (Penguin) and Fifty Years of Music: The Story of EMI Music Canada (Macmillan). He is passionate about the preservation of Toronto’s music history and in addition to his writing, he also leads walking tours on the musical history of Yorkville and the Yonge Street strip, and he was instrumental in the preservation of the historic “Sam the Record Man” sign which now hangs above Yonge Dundas Square. Congratulations to these outstanding Heritage Toronto Awards Historical Writing: Book nominees, and thank you for your work to preserve Toronto’s rich musical history. Congratulations are also due to all other nominees for the 2018 Historical Writing: Book Award – Bruce Newton, John Lorinc, Jane Farrow, Stephanie Chambers, Maureen Fitzgerald, Ed Jackson, Tim McCaskell, Rebecka Sheffield, Rahim Thawer, Tatum Taylor, Tim Morawetz, Scott Kennedy, Shawn Micallef, Robert C. Vipond, Roberto Perin, Phillip Gordon Mackintosh, Karolyn Smardz Frost, Lance Hornby, Adam Bunch, Timothy J. Stewart, Pedro Mendes, Terry Beauchamp, Trevor Cole and Gare Joyce. The Heritage Toronto Awards ceremony takes place on Monday, October 29 at the Carlu (444 Yonge Street). 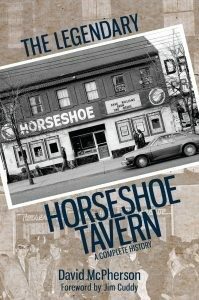 Tickets can be purchased on the Heritage Toronto website. 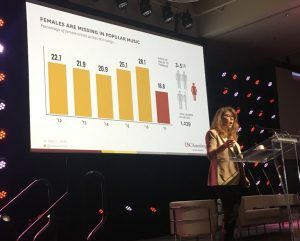 On Saturday May 12th, Music Canada held its third annual international Music Cities summit The Mastering of a Music City during Canadian Music Week. City professionals, policy-makers, industry executives, and music community members all gathered to discuss topics related to the value of music, its economic impact, and its relationship to innovative city planning and creative entrepreneurship. Click here to view more recaps of panels from the summit. The morning featured a panel entitled From Scratch: Imagining and Implementing New Programs and Partnerships, which discussed lessons imparted by successful music industry leaders on topics including identifying the needs in their communities, strategies to persuade partners and funders, and methods of benchmarking programs for sustainability. The discussion was moderated by Gene Meneray of the The ELLA Project, and included panelists Elizabeth Cawein, Founder/Director of Music Export Memphis; Enzo Mazza, CEO of the Federation of Italian Music Industry (FIMI); Kelly Symes, Ontario Festival of Small Halls; Madalena Salazar, IMTour, Western States Arts Federation. The panel kicked off with a conversation of the importance of engaging both the music and wider community when building up the programs. Kelly Symes discussed on how for an initiative like the Ontario Festival of Small Halls, securing community buy-in was an essential component of the process. Elizabeth Cawein similarly touched on the role of audience development for a project like Music Export Memphis, which acts as an international export office to create opportunities for Memphis musicians to showcase outside the city. Another major topic of discussion was the role of funding for non-profit initiatives, and strategies that can be utilized to help ensure proposed funding is robust enough for the program’s needs, and consistent enough to start building towards sustainability. Madalena Salazar described how the US-based organization IMTour worked to diversify their funding sources to not only rely on the National Endowment for the Arts, but to also utilize fundraising and other strategies. The panelists also touched on the positive impact that fostering strategic partnerships can have on a growing organization. Enzo Mazza discussed the important role that local political support had on the organization FIMI in its early stages, and how this attracted the interests of other prominent companies. Mazza highlighted how media organizations in particular were crucial to FIMI’s success, as the support of companies like VH1 helped lead to sponsorships by other major companies. Watch a video of the full discussion below, and stay tuned next week for a recap of another exciting panel. The Smithers District Chamber of Commerce and the Bulkley Valley Community Arts Council, located in British Columbia, have begun working to create the town’s first comprehensive music strategy. The group hosted a social on May 30th to bring together key stakeholders in the local music industry, and help secure their involvement in the strategy development. 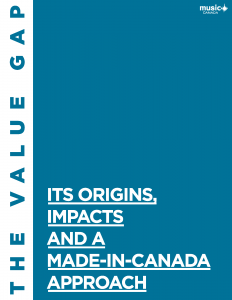 The impetus to begin this project arose out of a Music Cities Toolkit that Music Canada custom-built last spring for the Canadian Chamber of Commerce’s network of over 450 chambers of commerce and boards of trade. The Toolkit was designed to provide Canadian chambers of commerce with a roadmap and guide to activate the power of music in their city. “We as a group decided we need a music strategy, and we need to understand how music contributes to our economy here in the Bulkley Valley before we can start marketing ourselves as ‘Smithers: the Music City,’” Project Coordinator Liliana Dragowska told The Interior News. The group received funding through Creative B.C’s Industry Initiatives Program. As Dragowska described, the group began working on the early stages of the strategy that was introduced to attendees at the May 30th event. Gather information to assemble a Smithers music sector inventory that will inform a website. The website will be developed through the Northern Development Initiative Trust’s Marketing Community Development Fund. Gather preliminary economic information that will create a baseline for all things music. Conduct a Strength, Weakness, Opportunity and Threats analysis of the music sector in Smithers. Draft focused recommendations on how to strengthen and grow the music sector in the Smithers area. According to Chamber Manager Heather Gallagher, the music strategy will include 16 total recommendations aimed at three types of stakeholders: the local government, Chamber of Commerce, and those within the local music community. The final version of the music strategy will be presented to the Smithers town council on June 26th, 2018. 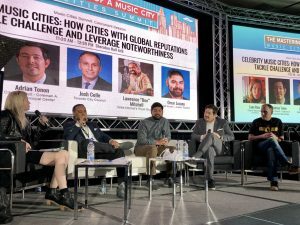 On Saturday May 12th, Music Canada held its third annual international Music Cities Summit The Mastering of a Music City during Canadian Music Week 2018. City professionals, policy-makers, industry executives, and music community members all gathered to discuss topics related to the value of music, its economic impact, and its relationship to innovative city planning and creative entrepreneurship. Click here to view more recaps of panels from the summit. The morning kicked off with a panel discussion between Seattle, WA’s Kate Becker and London, ON’s Cory Crossman, two Music Officers doing exciting work to build up their Music City. The topic centered around exploring their methods of turning music strategies into concrete results, and learning about different approaches they used to address common barriers and problems. The Music Officers began the conversation discussing the importance of developing a comprehensive music strategy that allows for flexible planning and policy-making. Cory Crossman, London’s Music Industry Development Officer, touched on the importance of branding when developing a profile as a Music City. He highlighted how the city’s path to promoting a ‘rock and roll revitalization’ in London was a key component of their approach and direction. Crossman also discussed the growing economic and cultural impact of music tourism for a city. Events like the Jack Richardson London Music Week, Jack Richardson Music Hall Of Fame, and the upcoming 2019 JUNO Awards have greatly contributed towards elevating London’s brand as a Music City attraction. Kate Becker, Director of Seattle’s Office of Film and Music followed up with touching on some of Seattle’s major music accomplishments. Some of the most notable milestones include an annual City of Music Career Day (now in its seventh year) and the Sea-Tac Airport “Experience the City of Music” initiative, a public-private partnership that features local musicians playing throughout the airport and exciting overhead announcements by renowned Seattle artists, such as Macklemore. The Music Officers also discussed the importance of ensuring an adherence to safety principles and conditions at music venues or events. Becker reflected on an example in 2015 where the city was faced with a troubling spike in incidences of drug-related issues at Electronic Dance Music (EDM) festivals and clubs. To address this, she implemented an approach that incorporated the input and participation of all the important players in this issue: promoters, venue owners, medics, harm-reduction experts, and more. 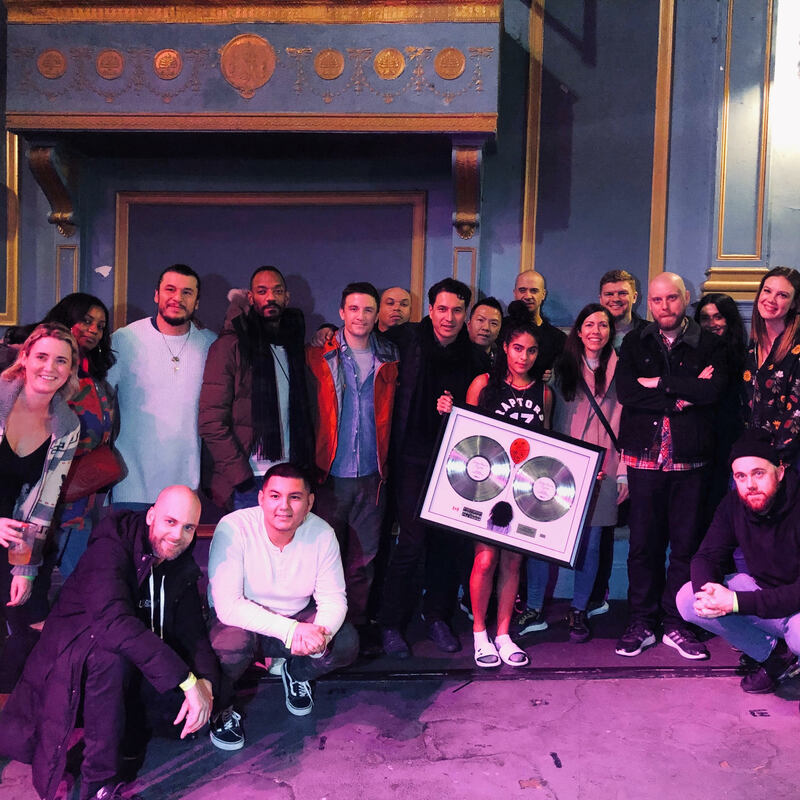 In particular, the Office of Film + Music collaborated with the city to host an annual ‘Music Safety Summit’ (now in its 4th year) that serves as a crucial public forum for key actors to work together towards progressive and effective solutions. Becker highlighted how this collaborative approach serves as a model that her office tries to utilize to address different situations that arise. 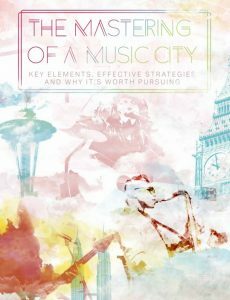 Becker and Crossman also touched on the critical importance of demonstrating the economic value of music to a city. Crossman credited the London Live Music Census as a major factor in gaining city and political support for the music strategy, and mentioned taking inspiration from Becker’s approach by ensuring that economic impact was measured and incorporated into policy-making. Becker agreed, and discussed how a 2008 economic impact study on Seattle’s music scene was the driving force behind the Office of Film + Music being established. Prior to taking questions from audience members, Becker and Crossman ended their discussion with a reflection on the importance of audience development, and ensuring that the fans and public are properly engaged and connected. 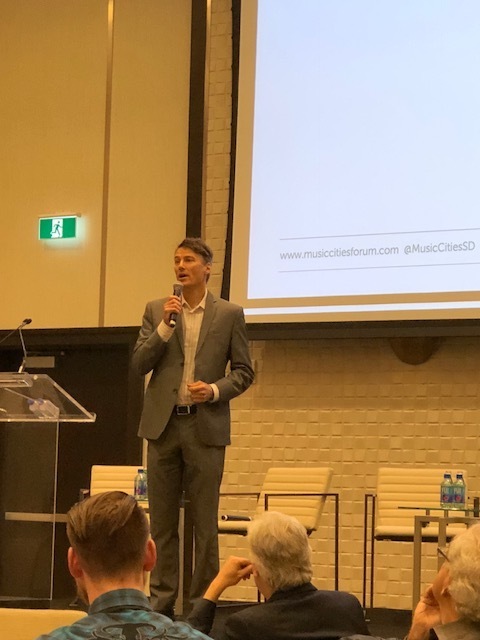 Vancouver’s Mayor, Gregor Robertson, announced this morning at the JUNO Host Committee’s Music Cities Forum that the Vancouver Music Strategy will be presented to council in summer of 2018. The strategy has been in development since mid-2016, led by the Vancouver Music City Steering Committee with input from an Advisory Committee. 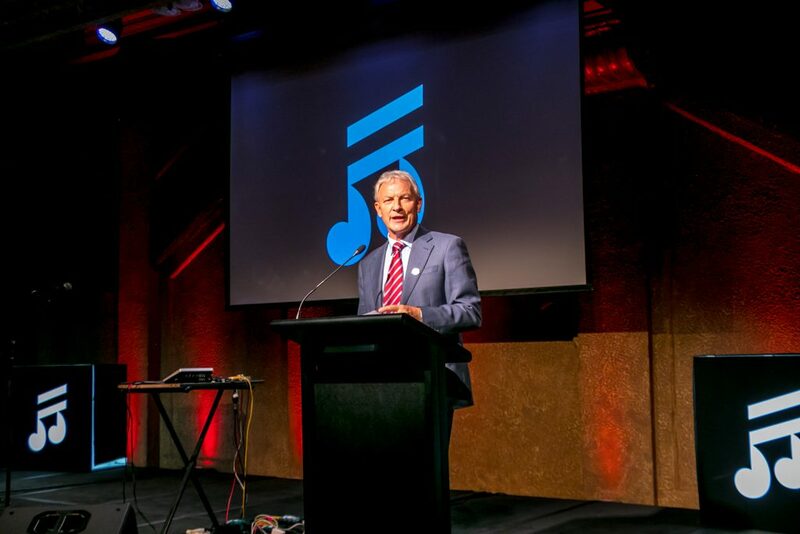 “There’s no doubt we have enormous potential in music and sound, particularly given the scale of our creative industries,” Robertson told the Music Cities Forum crowd. The Strategy will be informed by two concurrent studies that received support from the BC Music Fund’s Research Program: Music BC’s City of Vancouver Music Ecosystem study, also funded by FACTOR and conducted by Sound Diplomacy, and Music Canada Live’s Economic Impact Assessment of Live Music in BC, facilitated by Nordicity. Both studies are expected to be completed in spring of 2018. It is a thrilling day for music in Vancouver and the province of British Columbia, as the Government of BC also announced a new music fund this morning called AMPLIFY BC. The excitement over the two announcements was palpable at the Music Cites Forum. On Wednesday, March 7 at the Five Points Theatre (formerly the Mady Centre for the Performing Arts) in downtown Barrie, Ontario, representatives from CultureCap and Nordicity unveiled the brand-new Barrie-Simcoe County Music Strategy. The Strategy was informed by a recent survey that garnered more than 270 responses from community members across Simcoe County, as well as consultations with local artists, labels, venues, tourism officials and municipal staff from local governments. Combining various independent data sources, an inventory and map of musical resources in Simcoe County was constructed. 256 music businesses were identified in the County, mostly concentrated in five clusters: Barrie, Midland, Orillia, Wasaga Beach and Collingwood. As such, the Strategy sets a bold vision that “Simcoe County will be nationally-recognized as a constellation of distinct local music scenes committed to artistic ambition” within three years, where its distinct scenes shine brighter when united. The project is being spearheaded by many local partners: Regional Tourism Organization 7 (RTO7), Simcoe County, the City of Barrie, the City of Orillia, the Town of Collingwood and the Central Ontario Music Council (MusicCO). To guide the execution of the Strategy, a collaborative organizational structure in which MusicCO acts as a coordinating body of several Local Municipal Music Committees, beginning with Barrie, Orillia and Collingwood, is proposed. Stay tuned for updates from the project’s partners in the near future as the results of the study and the full Barrie-Simcoe County Music Strategy are officially released. 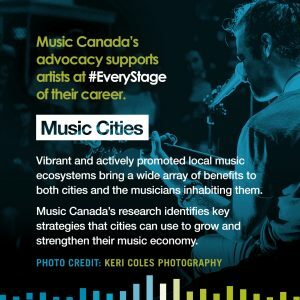 Last week Music Canada launched our JUNOS 2018 #EveryStage campaign, intended to highlight the ways our advocacy supports artists at every stage of their career, with a blog about our aim to secure equitable access to quality music education for all young Canadians. We’re proud to return as a Platinum Partner of the 47th annual JUNOS, sponsoring both the Album of the Year category as well as the official kickoff to JUNO weekend, the Welcome Reception. 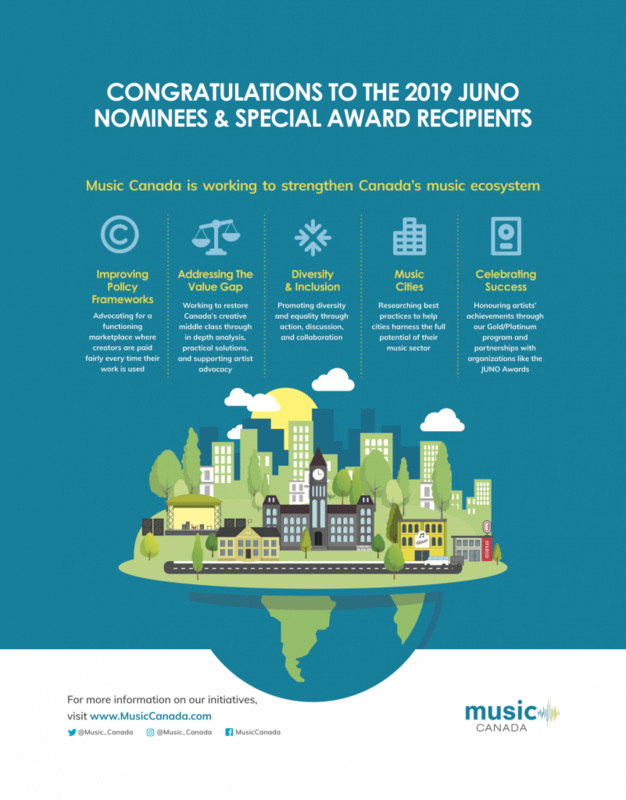 In the second installment of our four-part series leading up the 2018 JUNO Awards, we’ll explore Music Cities and Music Canada’s efforts to help make Canadian municipalities more music and musician-friendly. A Music City is a community of any size with a vibrant music economy. Vibrant and actively promoted local music ecosystems bring a wide array of benefits to both cities and the musicians inhabiting them. Economic growth, job creation, increased spending, greater tax revenues and cultural development are just a few examples. 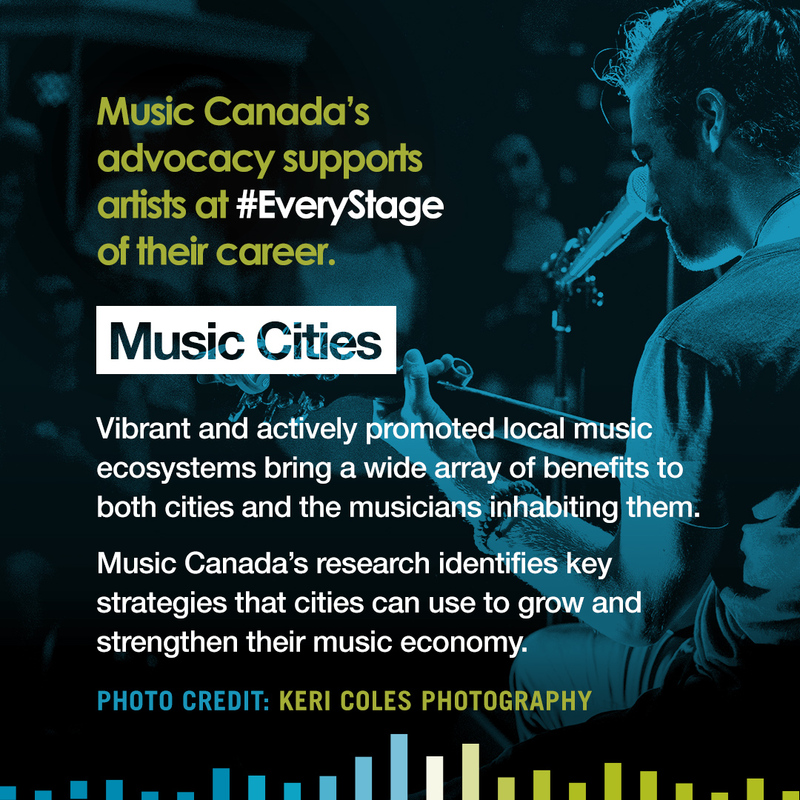 Music Canada’s world-renowned and globe-spanning research has identified several key strategies that cities both large and small can use to grow and strengthen their music economy. We work with municipal governments and regional partners to implement music and musician-friendly policies, establish music offices and advisory boards, as well as promote music tourism, audience development and access to the spaces and places where music is made. Cities across Canada, including London, Vancouver, Hamilton, Calgary, Toronto, Barrie/Simcoe County, Halifax, Moncton, Ottawa, Windsor-Essex, Guelph and more have implemented or are exploring measures to maximize the impact, growth and support for their local music ecosystems, and Music Canada has been proud to provide support through our research and expertise in the development of these strategies. Our 2015 report The Mastering of a Music City represents a roadmap that communities of all sizes can follow to realize the full potential of their music economy. Truly global in scale, the report is the result of more than forty interviews with music community experts, government officials, and community leaders in more than twenty cities on every continent. 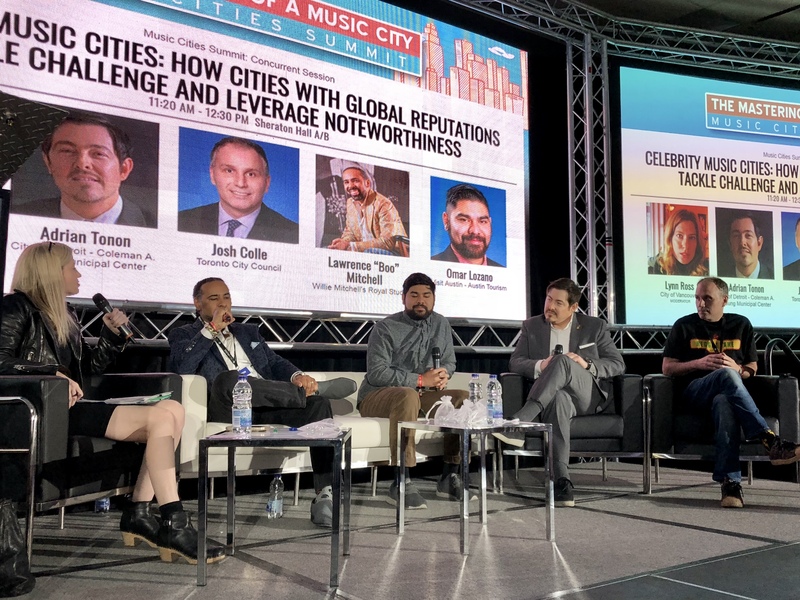 Our annual Music Cities Summit at Canadian Music Week brings policymakers, city planners and global music industry representatives together to discuss, learn and collaborate. Chambers of commerce have an opportunity to carve out a leadership role in leveraging music as a driver of employment and economic growth. 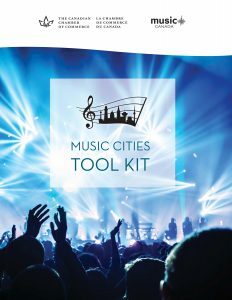 In 2016, Music Canada partnered with the Canadian Chamber of Commerce (CCC) to create a Music Cities Toolkit, designed to provide the CCC’s network of over 450 chambers of commerce and boards of trade, in all regions of the country, with a guide to activate the power of music in their city. 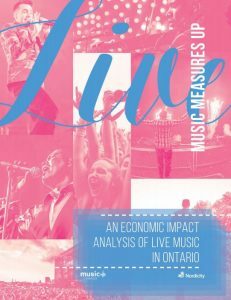 Live Music Measures Up is the first comprehensive economic impact study of the live music industry in Ontario. It provides critical data and information to help guide decision-making within the sector, in government and other allied stakeholders.